The F5B Avionik-B-10 F5F has been specifically designed for the 3 cells LiPo FAI Class. Also used with success in different European competition and by the Italian Team at the Worlds. This model is also computer designed and optimized and is a jewel in art of molding technology. Made from CNC machined moulds the parts, to achieve the best strength to weight ratio, are cured under high pressure and temperature. This leads to amazingly stiff, stable and true parts. Fuselage: Kevlar/carbon, high pressure 10 kg/m2, weight: 53-56 gr. Wing: sandwich of Fiberglas/carbon - balsa - Fiberglas, carbon spar, weight: 400-425 gr. (including servos). 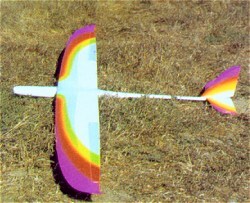 Stabilizer (+tail only): sandwich of Fiberglas - balsa - Fiberglas, carbon spar, weight: 55-57 gr. Special carbon spinner, with 33 mm dia., 12-14 g only including aluminum yoke. Specify motor shaft dia. when ordering. The model requires an additional (sub-)micro servos or better for elevator. X08-H are required for the wing. Power system: a great sport setup is the HP220/A2 P4 5:1 and RFM 14 x 14 to 15 x 13.